Cisco WLC Interfaces. | CCIE or Null! If you have ever worked with a Cisco WLC or have looked through any configurations for a WLC, then you have no doubt seen the interfaces that make it work. 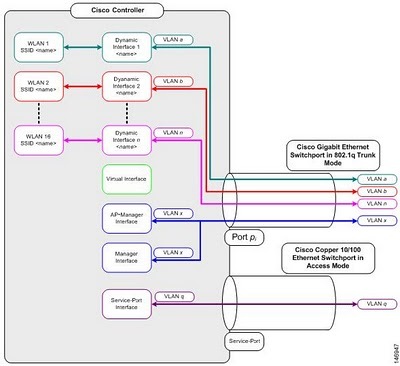 You’ve probably also seen that diagram concerning how these interfaces relate to the physical interfaces on a Cisco WLC. Now their are only five different types of interfaces (Management, AP-Manager, Virtual, Service-Port, and Dynamic Interfaces), I figured I would just take some time to quickly touch on them. Management Interface – As you can suspect this interface is for in-band management and handles any communication with AAA servers. This interface will also handle the layer 2 communication between the controller and any APs. Needless to say the configuration of this interface is mandatory and can not be skipped. AP-Manager – If you want to have APs on different subnets other then the subnet the WLC is on then this interface must be configured, it’s a requirement for Layer 3 LWAPP transport mode. So as you would suspect this interface handles all layer 3 traffic between the WLC and the APs. Since higher end WLCs can have multiple AP-Managers only 1 AP-Manager interface can be configured per physical port. « How can you build a better network? In the web authentication process the virtual interface ip is used; it looks as if the client is redirected to that IP. If operating in a layer-3 environment which of the remaining interfaces should you route the redirect traffic towards? You are correct the client is redirected to the virtual IP, however the traffic should not need to be routed. The virtual IP should only remain local to the controller and should not appear on any routing tables anywhere. Depending on the model WLC you are working with a pre-authentication ACL might need to be configured.